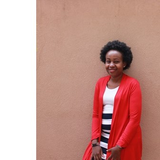 Faith Muange is a 2017 ADA fellow, YALI 2016 alumnae in Civic leadership, She holds a certificate in disability studies from Hawaii University, a Bachelor of Commerce – Marketing from university of Nairobi, certificate in Leadership, Management and Communication from Africa Management Initiative and a post graduate certificate in Kenyan Sign Language UoN. She is a social change catalyst transforming the lives of Deaf youths in Kenya by enabling Deaf youth live up to their full potential as they rise above stigma, stereotypes and marginalization that they face in life. She leads a team that is dedicated to equipping Deaf,Hard of hearing, visually impaired students with literacy skills.Catapult has a theatre arts program and summer programs to enable the students be confident, assertive and able to organize and lead others, to engage in their communities and have a greater voice in policy dialogue, community engagement and improving their livelihoods. I am the co founder of Catapult studios a social enterprise that innovates for students with disabilities.We have several products among them an e learning platform for deaf students. Illiteracy in Kenya according to Kenya Adult literacy survey is 38.5%. This margin becomes wider amongst deaf children, with only 5o making it through Kenyan universities. Statistics further indicate that 95% of deaf children are born of hearing parents who lack access to sign language until they go to school. In school the situation is compounded with many teachers of deaf not being competent enough and adequately equipped to teach deaf students. Catapult is contributing to resolving these challenges by providing an online literacy individualised education plan that enables them read and write in English to enable them understand other subjects and access a wider range of materials. It is also a platform through which deaf students can social network with others across the globe. We have mapped out our theory of change as follows:- •	Support to the possibility of personal access to information and knowledge and therefore resolve the issue of accessibility. •	Support to learning and teaching. By working hand in hand with academic institutions and government it will give a chance to give Deaf learners to receive both quantity in terms of education materials (in English) and quality (according to learning needs) this provides them a chance to participate effectively in society and thereby creates equal chances. •	Support to personal communication and interaction especially support to peer networks. •	Support to administrative procedures in education. I have a certificate in Disability studies from university of Hawaii with . major in deaf education.A diploma in sign language and interpretation from University of Nairobi.My undergraduate degree is in commerce with a major is marketing. I have a bachelors of commerce degree from university of Nairobi with my major in marketing. After graduation i worked for a local financial institution as a loans officer. Faith Muange updated their profile information. Faith Muange added interests Disability mainstreaming., STEM, augmented reality and more. Faith Muange changed their profile image.